From 1967 to 1983, Sly and the Family Stone laid down huge hits and played a vital role in the evolution of the soul and funk music genres in the United States. This San Francisco-based group’s career started off strong, but their productivity tapered off over the years as egos and drugs distracted them, and they eventually lost focus on the music. Their songs have been covered by everybody under the sun, but nobody has gone as far as Global Noize, who has created a super-slick tribute album, Sly Reimagined. Global Noize’s core members are DJ Logic on turntables, Falu on vocals and Jason Miles with the keyboards and programming. Miles was the producer and arranger for this album, which had to be a Herculean task with the complexity of the personnel that participated in the project. Noize is famed for seamlessly working guest artists into their live shows and recording projects; this time they outdid themselves, featuring 9 singers and 17 instrumentalists, including luminaries such as Roberta Flack and Nona Hendryx, as well as Greg Errico, the original Family Stone drummer. Sly Reimagined includes ten tracks, but only eight songs, as there are two versions of a few of the tunes. It would be a stretch to call this a blues album, as there is a heavy funk, jazz and world music influence, but it is a really neat collection of music with a unique sound that is quite compelling. Nona Hendryx kicks things off with “In Time,” and right away it is obvious that this is a tight album. The keyboards, horns and guitar are pure 1970s funk, but Butterscotch’s tasteful beatbox and Malika Zarra’s backing vocals give this song a modern world beat. “It’s a Family Affair” appears twice on this album: first with Roberta Flack on lead vocals, and a second time with Falu taking the lead. Flack’s take (the Groove Version) has a multi-layered contemporary sound with an infectious percussive beat overlaid with keyboards, turntables, horns, and counter vocals by James “D Train” Williams. Falu’s Mumbai Mix of this song provides a completely different tone, with her Indian-style vocals, crazy synths, Jay Rodriguez’s righteous tenor sax work and a decidedly more Spartan beat. I cannot pick a favorite between these two versions as both are very well done. Global Noize went in a different direction with their two versions of “The Same Thing,” as Hendryx takes the lead vocals on both. The first time up it has a fast tempo with turntable scratching and baritone sax. Then for the redux (67 Mullholland Drive Mix) they slowed things down considerably for a pure funk vibe with heavy keyboards, more of Rodriguez’s tenor sax and Amada Ruzza’s popping bass. Though the first version is very good, the second one blows this song out of the water, and I even prefer it over the Family Stone original. Maya Azucena provided the lead vocals for three of the songs: “Fun,” “You Can Make it if You Try” and “Stand!” She has a gorgeously throaty voice, and can hold her own with any soul or blues singer I have ever come across. This young woman from Brooklyn has appeared on many albums over the past twelve years, often times helping out worthy causes along the way. Throughout the album I was taken with how Jason Miles took the original Family Stone material and arranged it into an innovative format while still keeping the original spirit of the music alive. Even with diverse personnel contributing to each track, the album has a unified sound and theme throughout. The engineering and mixing are spot-on, and though I am very picky about production values, I found nothing to complain about here. Sly and the Family Stone was a very important contributor to our musical culture and history, and I am grateful that Miles and his crew of regulars and guest artists put their hearts into creating this tribute. 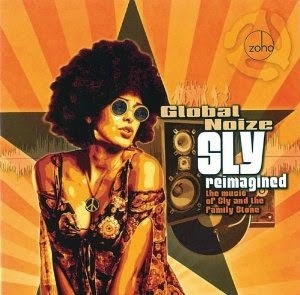 Sly Reimagined is not an album of cover tunes, but is instead a worthy tribute, and Global Noize has set the bar high. I hope you can check it out for yourself!